Art in 3-D: opening party for the new Fab-5 mural at DCI headquarters in Kent. The art work extends through two floors and into the backrooms. Fab-5 is taking graffiti art to new heights and kicking off 2013 on a high note: team artists Kenji Stoll, Chris Jordan, Troy Long and Travis Galindo recently completed a $90,000 art commission at the Kent, WA, headquarters of global electronics company, Digital Control Incorporated (DCI). They’ve created a multi-dimensional, two-story indoor mural that wraps around corners and hovers colorfully over workstations. It’s a work that’s sure to redefine “graffiti” and catapult it to a new level – one that integrates spontaneous, free-form painting with elegantly designed work space. Located in the neighborhood of the Boeing Co., DCI headquarters is about as big as an airplane hangar, and it provided Fab-5 with an unimaginably exciting palette. The warehouse is a model of swank industrial design with large central spaces where there are no cubicles – instead, banks of large, lush plants and crystal-clear window dividers section off work areas. Because the company specializes in electronics, the place is immaculate – but in the most appealing way. Dogs are allowed visiting privileges, there is a pingpong table on the mezzanine, and for focused quiet time, there is a submarine-size tropical aquarium that is filtered from beneath by small, living mangrove trees. The company is a leading designer of drilling guidance systems with offices in Germany, China, India, Australia, and Russia. 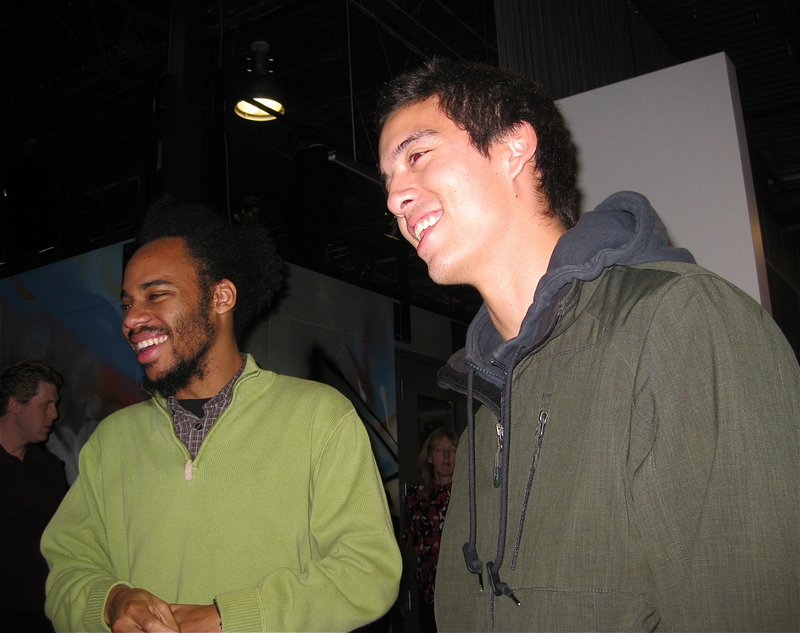 Spaceworks alums Chris Jordan and Kenji Stoll at the dedication of the Fab-5 mural. 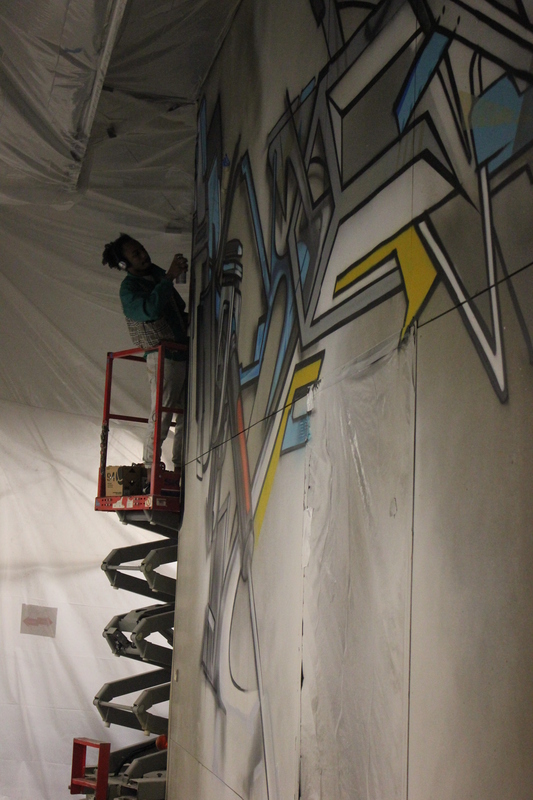 The challenge for Fab-5 was to create a visual environment that dozens of engineers and designers would all be amenable to working in (plastered in graffiti? ), and that would complement the space’s clean architectural style. Oh, and a deadline of two months – that alone would keep the Five in respirator masks and working around the clock last summer. The result of their efforts: an immersive environment that is over the top, and hard to describe. On the walls, cumulous clouds of color give birth to silhouettes of gadgets related to drilling guidance systems; Jordan and Stoll, the team’s liaisons, spent hours interviewing the engineers about their work and its components, and recorded motifs that would be catalysts for thought. Color and design merge to create a dynamism that keeps the eye moving from floor to ceiling and around corners. They didn’t hold back; as Jordan pointed out, going for generic graffiti effects would have doomed the work to the pleasantly dull realm of chain restaurant art. At the mural dedication, visitors were plainly awed by the work. Most importantly, the clients, founders Peter Hambling, and John and June Mercer, were elated. We caught up with Kenji Stoll to ask him how the commission was executed, and how the four artists in Fab-5 managed to keep the collaboration rolling smoothly. Spaceworks Tacoma: Hi Kenji. How was painting indoors different from outdoor graffiti? Kenji Stoll: Painting indoors definitely presents a whole new set of challenges that we otherwise don’t deal with when painting outdoors, especially [when it is] a professional office environment. For instance, things like ventilation and fresh air become a much bigger deal when painting indoors because you don’t have any kind of breeze to help disperse the paint fumes, so they tend to linger around. Also, when you do a lot of spray painting the particles tend to settle on everything around you creating a film of color-dust on every surface imaginable. Definitely tinted my bed and computer before this way in my own house. [The perimeters of this job] directly influenced our approach to creating the art, and the type of work that was produced. Because we were encapsulated in this massive, clear plastic tent and had to wear respirators – which none of us normally wear, for the record – it made me feel like we were in some kind of quarantine zone doing a top-secret graffiti project. It was really something else…Additionally, painting indoors adds a different sort of pressure to the work you’re creating because you know people are going to interact with it differently; like, they probably will go right up to it and look at it for every detail that’s there – and it will be there forever! So, it definitely brings a different energy to creating the work for me, in a way that makes me way more meticulous and detail oriented than I would be if I were just painting freely outside. ST: Graffiti is not the kind of art one normally associates with a company that specializes in guidance systems and technology. What does Fab-5’s artwork bring to the workplace; how does it enhance it? KS: I feel like this is really a question that you would need to ask the people at DCI. I’m obviously biased and would be an advocate for cool graffiti artwork in any workplace. But, to answer the question, I think the kind of artwork we do really can bring an energy and a sense of unique identity to a work setting. You can always run through a place and paint some cool graffiti on the walls of an office, but to really create a piece of [art] that becomes a part of the work environment and vibes with the culture, is a challenge and what I hope we were able to do with DCI. ST: The walls at DCI provide a really nice painting surface; it almost has a sheen. KS: The wall material is called Viroc, and it is imported from Portugal. I’m not sure what the exact properties of it are, but it’s something “impregnated” with concrete, as the architect put it. ST: How much Krylon spraypaint did you use? KS: We actually didn’t use any Krylon paint for the mural but we did use a mix of different brands including MTN94 and Belton Molotow spraypaints. Both come from Europe and can be bought online here in the states. In total, I would guess we used about 1,400 cans…. ST: How long did it take you to do this artwork from conception to completion? KS: In total, we spent about eight weeks in total from conception to completion. About three weeks of intense designing, two weeks preparation in ordering materials and getting random technicalities in order, and then three intense weeks of painting. ST: Artistic collaboration can be a wild beast. How did the four of you manage to peacefully and productively work amongst yourselves? KS: I’m glad it seems that way (laughs). No, we definitely are a pretty collaborative group, though that doesn’t mean we don’t get ourselves off track every now and then. But I think the biggest reason we’re able to work so well together is because we all are trying to push ourselves and our work to the next level. Even with every debate, argument, or off-topic rant that happens it still comes back down to us wanting to create our best work ever – so with that as our foundation for working together we’re really able to collaborate and put our own egos to the side to do so. ST: Chris also mentioned that you all have unique strengths – from digital sketching to project management to freestyle painting – that tend to interlock in a complementary way rather than overlap, so that each member led the group at different stages of this huge, complex process. Collaboration trumps competition! ST: You were on a very short deadline. How did you satisfy the client’s needs without endless rounds of meetings? KS: This is something (learning from past experiences) that we usually work out in our contracts. However, for this project it really didn’t have to come down to that; the owners of DCI were really reasonable and down-to-earth people, making it easy to get a sense of what they were interested in and what they weren’t. Even though this was our most challenging project to date, they were some of the easiest people I’ve ever worked with. [As for meeting the deadline,] we just get it done. In this case, there really wasn’t an option for us to carry this project on past its original planned deadline. It pretty much had gotten pushed all the way back to the last week of August, which for me was right before I left on a two-week trip to Japan, and for Chris it was right before he went back into full-time school. So, when it came down to it we just had to grind it out, and we finished painting on August 30th. ST: How long have the 4 of you known each other? KS: I’ve known Chris since middle school; we were in a computer class together, and then reconnected in high school and became better friends. I’ve known Travis and Troy since I was a student in Fab-5’s L.I.F.E. Program back around the same time, so since I was about 14. You should check with them, but I’m pretty sure Travis and Troy have known each other since high school. ST: What are your ages? KS: Kenji – 21, Chris – 22, Travis – 29? Troy – 29? I’m not exactly sure about Travis and Troy, but I’m sure they’re either 28 or 29. ST: You guys are amazing. Congratulations, and Happy New Year! New Year’s plans up in the air? Studio 54, at TAM!